From a diplomatic perspective, the European Union (EU) is a baffling entity. On the one hand, it represents a political union of 28 member states. As such, it has governing bodies, legislative bodies and a foreign service that promotes the E.U.’s interests around the world. On the other hand, each member state in the E.U. has its own government, legislative bodies, foreign ministry and embassies that promote its interest around the world. Yet whether it is baffling or not, one cannot ignore the political and economic importance of the E.U. or its active role in world diplomacy. Moreover, the E.U. has established a formidable presence in the new frontier of diplomacy known simply as digital diplomacy. And it is this presence that prompted me to evaluate the E.U.’s Twiplomacy. The first step in this task was to decide which E.U. twitter account to analyze. Here I ran into the familiar problem of plurality of channels. At the moment, there are dozens of active E.U. twitter accounts. As can be seen in the image below, the E.U.’s legislative bodies are on twitter as are its elected officials (President of European Council), it foreign service (External Action Service), its various organizations (E.U. on Climate) as well as its embassies and diplomats located around the world. Such a plurality often leads to the frustrating question of- who do I need to follow on twitter in order to gain insight into the E.U.’s foreign policy? 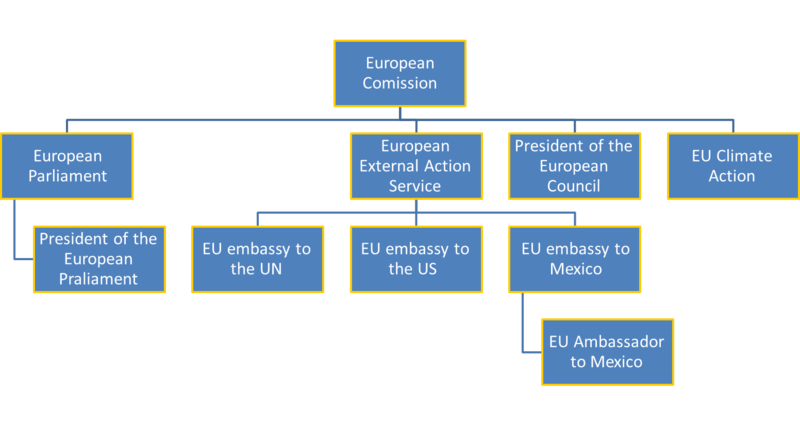 I finally decided to focus on the E.U.’s External Action Service (@@eu_eeas), or foreign ministry. Analyzing this account was possible by analyzing the social network of foreign ministries. As foreign ministries now routinely follow one another on twitter in order to gather important information, it is possible to imagine all links between foreign ministries as a global social network. This network is presented in the image below. 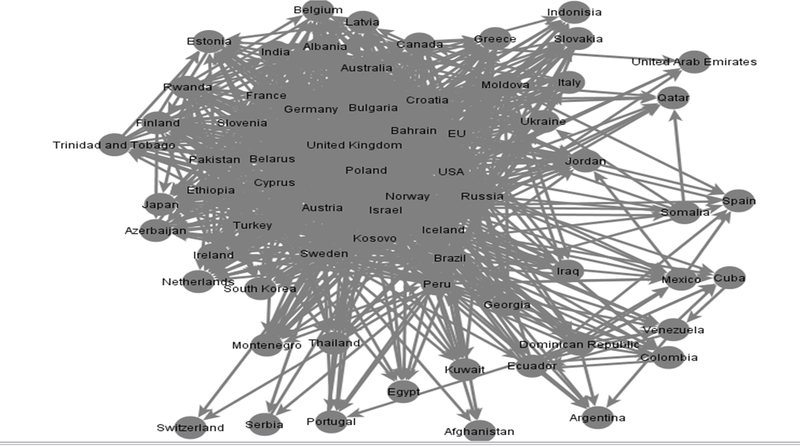 The most densely populated gray area, shown below, represents the heart of the social network of foreign ministries. Foreign ministries located there are the most popular in the network and are also the most avid followers of other foreign ministries. When analyzing this network, I calculated three parameters. The first was the in-degree parameter which relates to a foreign ministry’s popularity within this network. This is an important parameter as the greater a foreign ministry’s popularity within the network, the greater its ability to disseminate information to other foreign ministries. The E.U. scored the 3rd highest score on the in-degree parameter as it is followed by 38 other MFAs (out of a sample of 69 ministries). The next parameter I calculated was the out-degree parameter which relates to the extent to which a foreign ministry follows its peers on twitter. This is also an Important parameter as the more MFAs one follows, the greater its ability to gather information on other nations’ foreign policy initiatives. In the out-degree parameter, the E.U. scored the 6th highest score as its follows 41 of the 69 MFAs in this network. The final parameter to be analyzed was the betweenness parameter. Calculating the betweenness parameter revealed which ministries serve as important hubs of information as they link together ministries that do not follow each other directly. The E.U. scored the highest score on this parameter indicating that it is the most important information hub in the social network of foreign ministries and serves as a crucial “Twiplomatic” link. It should be noted, that the E.U.’s External Action Service in one of five MFAs to score high on all three parameters (along with Sweden, Russia, Poland and Israel). 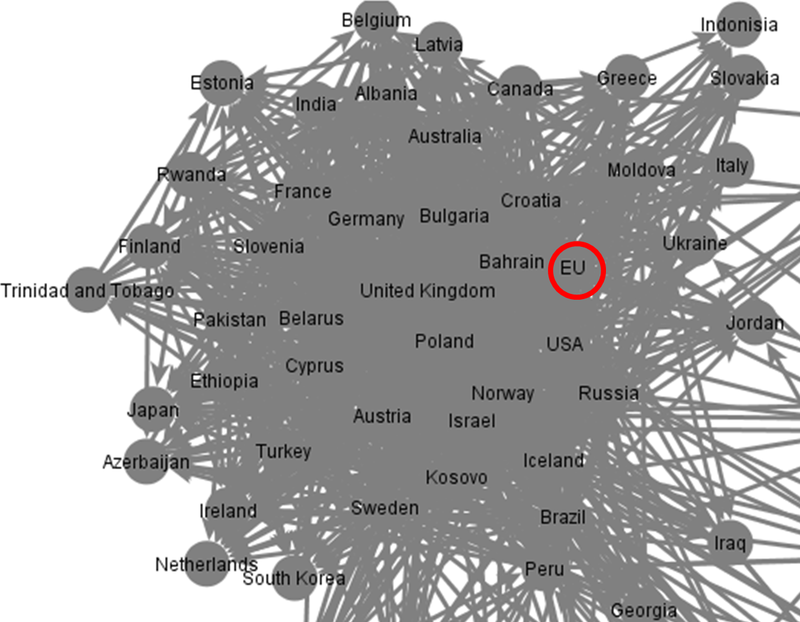 Next, I decided to analyze the location of the E.U.’s embassy to the UN in the social network of embassies to the UN . This is an important indicator of the E.U.’s Twiplomatic presence as the UN headquarters in New York is the world’s most important hub of diplomacy. 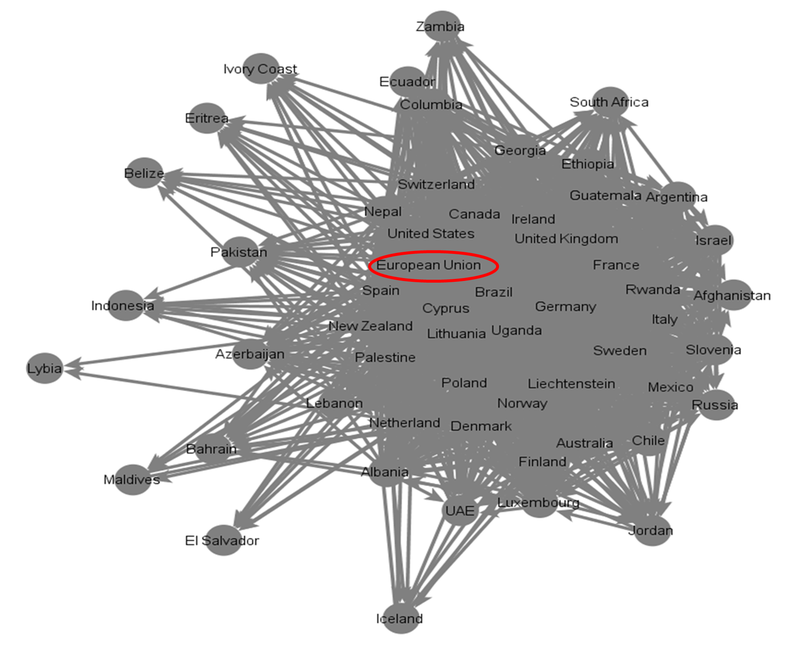 The social network of embassies to the UN is presented below. The E.U.’s embassy to the UN (@EUatUN) scored the 5th highest score on the in-degree parameter indicating that it is the fifth most popular UN embassy in this social network. Moreover, the E.U.’s embassy to the UN scored the 7th highest score on the out-degree parameter indicating that it actively follows the majority of other UN embassies. Finally, the embassy scored the 3Rd highest score in the betweenness parameter indicating that the E.U. also serves as an important information hub within the United Nations. It is important to note that the E.U. is the only diplomatic entity to score high on all three parameters in both the UN social network and the foreign ministry social network. My final analysis explored the distribution of fans of the External Action Service’s Facebook page by geographic region. This is, in my opinion, an important analysis as it demonstrates an MFA’s global reach alongside its domestic reach. In the age of digital diplomacy, MFAs that are able to attract large domestic audiences can directly communicate with their citizens without going through the filter of the mass media. 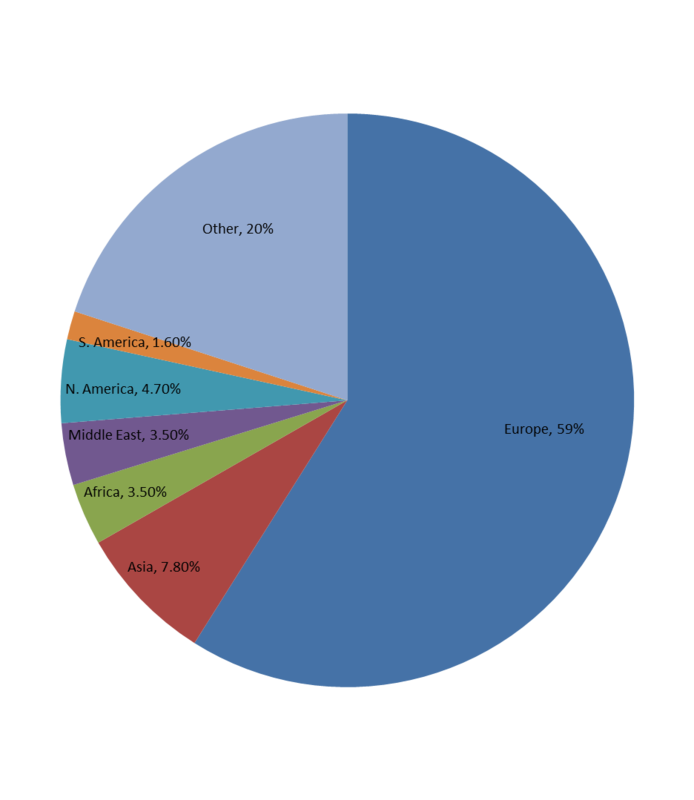 The External Action Service’s Facebook page fan distribution by region is presented below. As can be seen, the vast majority of E.U.’S Facebook fans are from Europe itself (59%). Moreover, the E.U.’s local audience base is larger than that of the US State Department, the UK’s foreign office and Israel and Poland’s MFAs. Given its high scores in the Twiplomacy social networks, and its ability to attract a massive local audience base, it’s possible that when it comes to Twiplomacy, the E.U. is in a league of its own. Posted in Uncategorized and tagged Digital Diplomacy, EU, European Union, Facebook, social network, twiploamcy, Twitter, UN. Bookmark the permalink.